Please Note: This venue is not wheelchair accessible. Tickets are $7. Purchase at the door. Advance ticket purchase strongly recommended. There are no extra service fees to purchase in advance. All tickets sales are non-refundable. NOTE: No tickets will be mailed no matter what shipping method you choose, they are available at Will Call, on the day of the screening. This documentary recalls the popular sport of handball and one of its legends. That legend was Mr Morris Levitsky, also known Morris Levitsky, aka Morris 'Moishe' Novitsky'. Mr. Levitsky, was one of the seminal characters in this unique sport from the mid 1920 to end of the century. 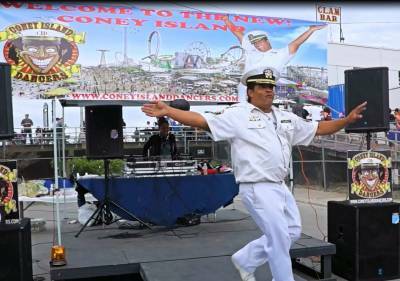 "The Commander in Chief" is a glimpse into the life of Rican Vargas, the self proclaimed Commander in Chief of the Coney Island Dancers. Mr. Vargas wears a lot of hats, and is part of the collage of colorful characters in Coney Island. The film covers his life story; how he and Coney Island were affected by Hurricane Sandy; and explores what it takes to get ready for the summer season in Coney Island leading up to the Mermaid Parade.